According to Environment Canada's senior climatologist David Phillips - Calgary is considered to be the "hail storm capital of Canada". He maintains that these damaging storms can be attributed Calgary's proximity to the Rockies. The Insurance Bureau of Canada estimates that the heavy rains, high winds and tennis ball sized hail that hit Calgary and southern Alberta in August of 2015 will increase insurance claim payouts in Alberta from weather related events to $4 billion since 2013 alone. In addition to raising deductibles and increasing premiums as a result - some insurance companies are now offering insurance premium discounts for installing more impact resistant roofing materials. The Insurance Bureau of Canada has also been working to change existing building codes by petitioning the construction industry to use more hail resistant roofing products in new construction. The number one priority both during and after the storm is to ensure your family is safe. If someone has suffered injuries, powerlines are down, trees or large branches have fallen onto roadways, structural damage to your home or any other safety concerns – Call 911. Wait until the storm has passed before checking the exterior of your home or business for damage. 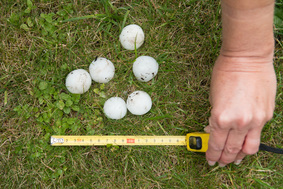 Take photos of hailstones around your property to further support your insurance claim. You may even want to take a video of the storm’s intensity. Check out this link from The Weather Network to see what we mean. Take a walk around and look for any dents on, roof vents, the eavestrough, roof flashing, flashing, downspouts, and your shingles. Watch for areas missing granules, cracks in random areas and sections that are soft to the touch. Hail storms in Calgary frequently cause water leaks, structural damage, punctures and dents to plastic or metal components of your home. Remember, just because you cannot see any roof damage does not mean it is still not there. A trained roofing professional or experienced insurance adjustor may see damage that the untrained eye may miss. Before contacting your insurance agent, you should have a reputable roofing contractor inspect your roof for potential hail damage as quickly as possible. The roofing contractor will walk your roof to assess if it has sustained hail damage to reasonably justify an insurance claim. 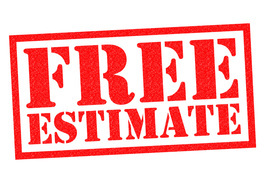 The roof inspection should always be free as it is just one of the roofing contractor’s costs of doing business. • Schedule roof inspections with three reputable roofing contractors. • Make sure you are at home to meet the roof inspectors. • Describe what happened during the storm and show the roofing company any photos or videos you may have. • Observe the roofer as they do their inspection. • Ask the roofer to outline damaged roof areas with chalk and take pictures to review with you later. • Stress that no repairs are to be made as this is an inspection only. Be wary of a roofing representative who pressures you. Do not sign anything at this point. Collateral damage is considered any damage to your home or property that would not be part of the roof itself. This could include gutters, eavestrough, soffits, power vents, siding, air conditioning units, screens, doors, windows, satellite dishes and more. It is also important to check other objects on your property for hail or wind damage. There may also have been be damage to sunrooms, greenhouses, vehicles, fences, sheds, patio/lawn furniture, barbeques, playground equipment, trees, shrubs, gazebos, hot tubs, etc. This property may also be eligible for coverage under your insurance policy. After the insurance adjustor has done his inspection and your insurance claim is denied - don't give up. You may have had new or inexperienced adjuster or claims analyst who has made a mistake. Many denied claims are due to a miscommunication or misunderstanding. If these are addressed early in the process - they can usually be resolved. If you are still unhappy with your insurance company's decision - you can always make a formal complaint to the Canadian Council of Consumer Regulators.